A new group of MSc Students started on their journey towards a Master degree at Wittenborg this week, kicking off with three days of orientation activities before starting with their classes on Monday. The new students are from Russia, India, Nigeria, the Netherlands, Spain, China, Germany, the Ukraine, Iran, Albania and Vietnam. The most popular Master of Science programme this year is the MSc in Sport Business Management – almost 40% of all students will study that. 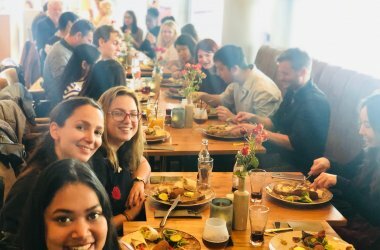 The rest of the students are split over the other programmes – MSc in International Tourism Management, the MSc in International Hospitality Management and the MSc in International Event Management. Many EU students, who are allowed to follow a part-time Master degree, said they appreciate the fact that this option is available at Wittenborg. Wittenborg’s MSc programme is offered jointly with its long-term education partner, the University of Brighton in the UK. Some of them are already familiar with the education system at Wittenborg as IBA alumni. Wittenborg’s Student Registrar, Santosh Aryal, said he was happy to see Wittenborg alumni who graduated this summer start with the MSc programme. “Wittenborg’s flexible entry date system allows for this.” The two alumni are Gertnisa Ristani from Albania and Jesse Ighalo from Nigeria. Last Wednesday students attended an orientation session at Wittenborg’s campus in Apeldoorn. On Thursday they were given an introduction by Brighton on expectations and outcomes of the study proramme, followed by a lunch with staff members and attending sessions on report writing, referencing, group working and presentation skills.